Actually, not a whole lot is new! Same old same old around here. But my blog looked awfully lonely so I figured I should post. ;). Spinning: 16 down, two to go! I’m spinning the last two batches of thank-you yarn simultaneously because I feel so bad that someone has to be last. I’m halfway through one, and about a third of the way through the other. 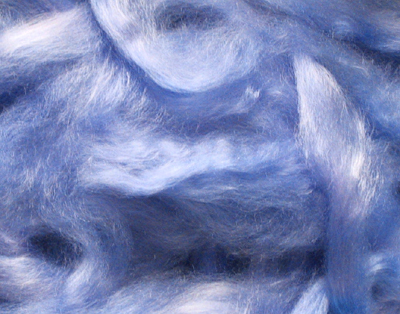 And omg, I am in luuuurve with merino/tencel…it is an absolute dream to spin. Don’t you want to touch it?? Knitting: sock #1 is done, and it’s cushy and cozy and awesome. Sock #2 is stalled, because I haven’t had a lot of out-and-about knitting time lately. I knit the heel flap on Thanksgiving, and picked up the gusset stitches, but I really had to put it away because I couldn’t work on it without being antisocial, what with the keeping track of the cable pattern while decreasing while my children jumped on and off my lap and begged for more pie and all. Misc: I’m tired. I stay up way too late. But I can’t help it, it’s sooo quiiiiet. I got a huge head of romaine lettuce today, and made a ginormous salad with green peppers, cucumbers, carrots, red onion…grated parmesan and fat free caesar italian dressing…it was amazing. Then I went to the gym. Go me. Then I came home and made eggnog milkshakes. Does that count as two steps forward, one step back? Or does the milkshake completely negate the other two? When you have several containers of roving soaking in the utility sink? After reading blog after blog, with accounts of fiber festivals galore, most of them containing “first, we made a mad dash for The Fold…” I decided it was time to go check them out. I do live an hour away, after all — not a bad trip on a Friday morning. I’ve had my eye on these…. 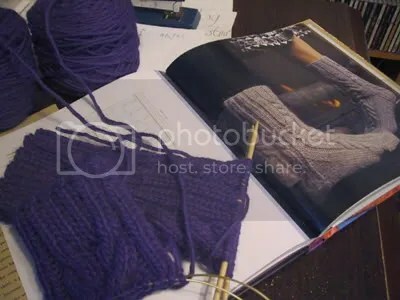 I’m still amazed that the pattern calls for a yarn I actually have on hand. Not that I wouldn’t sub, but…cool. Very cozy. 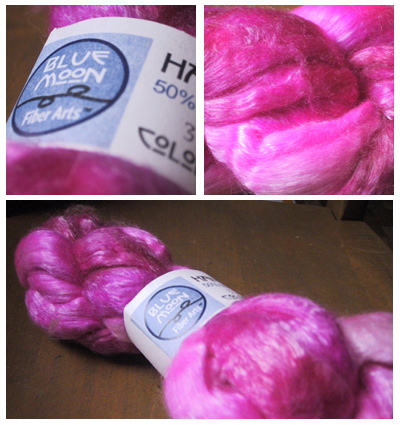 And speaking of hpy.com, omg, look at this roving. Drool.